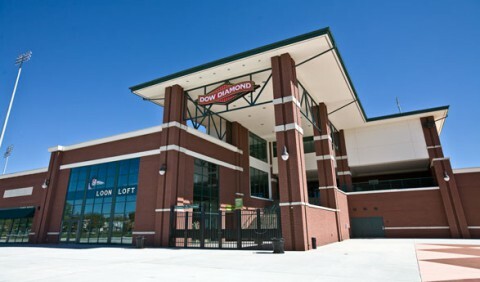 MIDLAND – Three Rivers Corp. has received one of the nation’s most prestigious building awards for its construction work on Dow Diamond, home of the Midwest League’s Great Lakes Loons baseball team. Associated Builders and Contractors (ABC) announced this week that Three Rivers has won its National Excellence in Construction Award. Among those were the architects, HOK Sport, who said the project would take at least 24 months. But accustomed to fast-track procedures used in working with its industrial customers, Three Rivers was able to begin construction with only conceptual drawings and complete the project in 141/2 months. Through value engineering during the process, Three Rivers helped save more than $2 million on the project’s cost. Innovations here included using crushed brick recycled from a building on the site for the warning track surface, developing a roofing alternative and revisions to the structural framing. The 5,400-seat stadium was built almost entirely by mid-Michigan workers and used a number of products produced locally. Dow Chemical’s STYROFOAM™ insulation products were used in several applications. The stadium was the first commercial application of Dow’s SAFE-TOUCH™ PET Fiber insulation. And solar panels, used to generate a substantial percentage of the stadium’s electricity, featured components created by Hemlock Semiconductor, a subsidiary of Dow Corning Corporation. Crews also overcame a number of unique obstacles, Kozakiewicz says. “There was a lot of site remediation issues that we didn’t know at the beginning,” he says, noting that parts of the site formerly housed five service stations with underground storage tanks. The Michigan Department of Transportation was also doing major roadwork nearby. The project was completed with no on-the-job injuries, illnesses or precautionary ambulance runs. “We had a meticulous eye on safety,” Kozakiewicz says. Contractors participated in safety training programs and meetings. Some of those sessions included guests such as former Los Angeles Dodgers Manager Tommy Lasorda and the Great Lakes Loons’ mascot, Lou E. Loon. ABC’s Excellence in Construction program was designed to offer public recognition for excellent performance in the merit shop construction field. The award honors all members of the construction team: contractor, owner and design team. The competition is open to all construction projects completed by ABC member firms in 2007. Winning projects were selected based on complexity, attractiveness, unique challenges overcome, completion time, workmanship, safety, innovation and cost.